This is a light weight powerful sounding instrument. It is designed price wise not to break the bank, but give the player a powerful sound with great tone. It has a burl walnut resonator with black binding, ebony finger board, tone hoop with a 3 ply maple rim. The Bishline Patriot is the perfect banjo for someone wanting to step up from an import or someone looking for a lighter weight banjo. The Patriot features a bevel cut, three-ply maple rim and tone hoop that weighs three pounds less than full weight tone ring banjos. You will be pleasantly surprised at the tone, volume and clarity this banjo produces! The patriot is a very very good choice in a moderate price range. It has a really warm sound as it has a tone hoop instead of a tone ring. 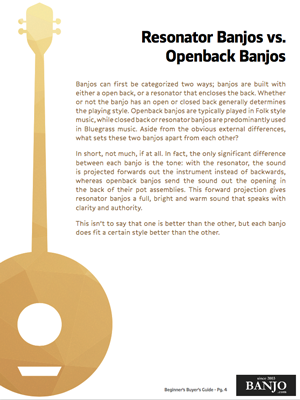 It is a real joy to play and a shop favorite here at banjo.com. Manufactured in America by Bishline Banjos exclusively for Banjo.com. A serious banjo with a serious look! Black stained wood with nickel hardware and black tuners. Designed to have a woody sound acoustically and a great amplified sound at high volume. Comes with figured mahogany resonator with flame maple binding, ebony fingerboard, Bishline/ barnes woody rim/ring, black powder coated hardware and L.R. Baggs bridge pickup. Considered the Bluegrass workhorse, we feel like this is the best value for an American made full weight tone ring banjo on the market today. Fancy burl walnut resonator with satin finish, ivoroid binding, MOP inlay, three ply maple rim, nickel plated hardware.